We really had a wonderful time at the open house yesterday. Many thanks go to all those who helped, especially my sister Genny who comes several times each year to help decorate, set up trees, cut greenery, etc. Though by Saturday I was wondering (as I do each year) if we would be able to get everything done, the house pulled together well. The weather was rainy, extremely windy and got colder as the day went on. The temperature was about 60* F at noon and down to 36 by 6:00 p.m. But it didn’t keep down the crowd by very many. We usually have about 200 guests and this year we had 170+. It was a tremendous amount of work, but a tremendous amount of fun, too. DH wasn’t able to take as many pictures as I had hoped he could, but others took pictures and I hope to get some copies of those. The party was supposed to start at 2:00 pm and we had company as early as 1:30, so we didn’t have time to take “before” pictures which I like to do each year. Our friends Gary, Laurie, Bethany and my sister Genny all helped in the kitchen which was great. It’s become a tradition and we so appreciate their generous gift of time! They keep the cookie trays full, the coffee filled, and the punch flowing. I don’t have to give it a second thought. I know it’s in good hands. 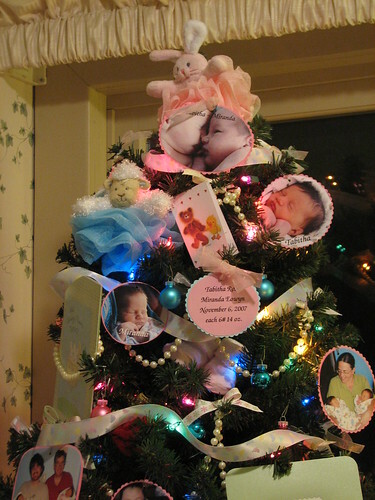 The grand-baby tree was a favorite. Everyone liked it. 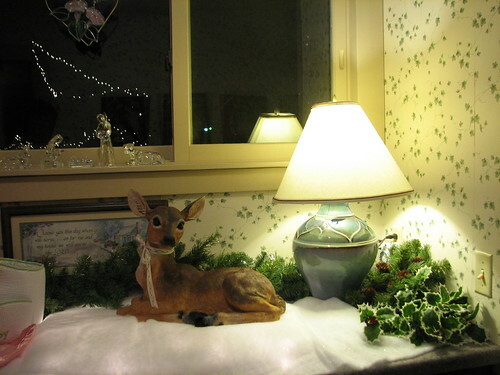 On the right side of this counter I have a deer. It sits on a piece of tabletop glass which is elevated on wooden blocks. We put white lights under the glass and batting on top. Makes a lovely night time display. The grand-baby tree sits on the counter in the addition where the guest room, laundry room and downstairs bath are located. 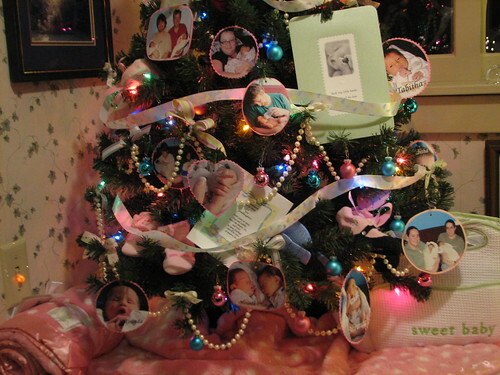 Across from the tree there are pictures of our children as babies. 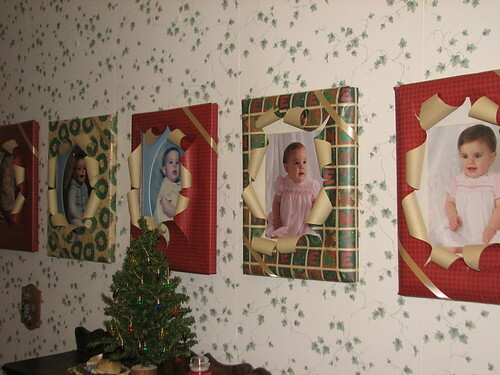 I wrap them each year as gifts. 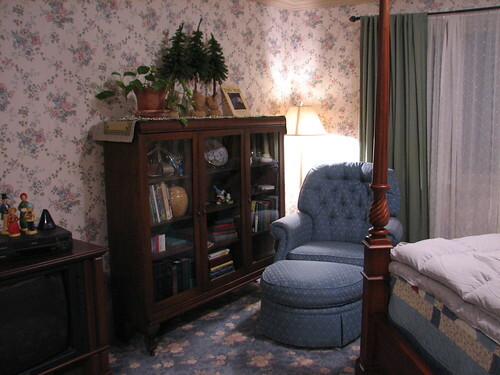 The laundry room and downstairs bath, just off the hall in the addition, have a garden theme for Christmas. 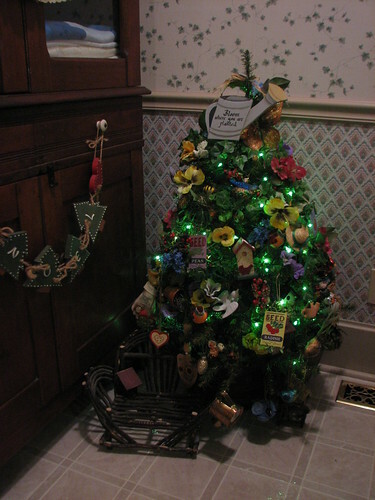 The little tree in the laundry room is decorated with garden ornaments, pansies, birds, butterflies, and insects. The tree sits in an old wooden sugar bucket from DH’s family farm. 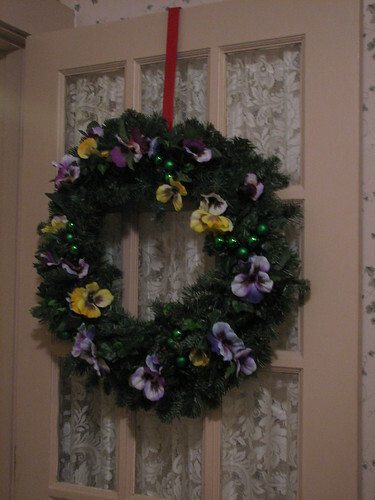 The wreath on the laundry room door has pansies and small green balls on it. On the bookcase in the guest room, we display the book A Tale of Three Trees. 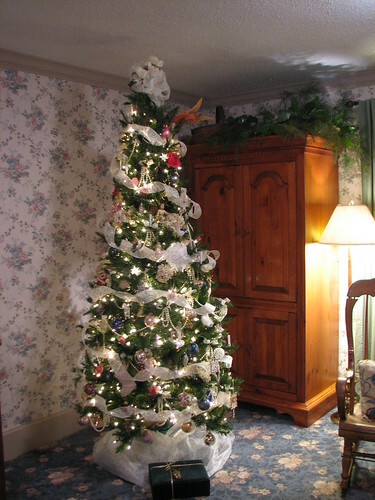 The tree in the guest room is decorated with a Victorian theme. We had a slide show of the baby pictures in the library on my computer and a slide show in the office of cookie making. Guests enjoyed those. 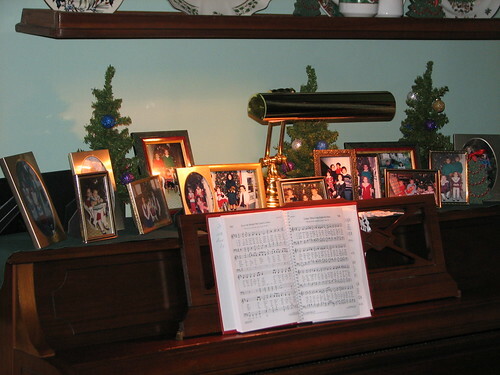 The piano in the office is decorated with pictures of our children. These are pictures that have been used in our Christmas cards in years past. The young lady who cleans house for us came today and vacuumed cookie crumbs throughout the house. But she didn’t have to do much other cleaning. My kitchen crew had cleaned the entire kitchen, took the serving tables apart, put the tablecloths in the wash, etc., so Sam cleaned the baths and vacuumed the floors. Made it all fresh again. I delivered cookies to the teachers/staff at DD’s school and then did my grocery shopping while Sam cleaned. Now I am enjoying a very quiet relaxing afternoon, which is quite a change from the hectic work we’ve been doing for a few weeks. 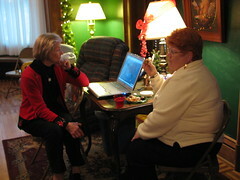 Thursday night about 15 women from my home extension group will be here for our Christmas party. The 14th we are hosting a house concert by Nathan Clark George. He has a beautiful Christmas album and will be performing songs from that on the 14th, accompanied by two other musicians. On the 15th, 12-15 women from a local PCA church are coming for a house tour and potluck supper. A busy but fun time of year. Time to get supper started. I will try to post more this evening. You can see these and other pictures on my flickr site. This entry was written by ~~Rhonda, posted on December 3, 2007 at 4:21 pm, filed under Christmas, open house and tagged Christmas, christmas trees, open house, party. Bookmark the permalink. Follow any comments here with the RSS feed for this post. Post a comment or leave a trackback: Trackback URL.